I never saw myself as the kind of person who would get a tattoo–in fact, I saw myself as the person who would never get a tattoo. I hadn’t even considered it until a certain phrase crept into my head. These three words quickly became some of the most important words in my life. As soon as I wrote them down, I knew I was going to get a tattoo. I knew I had to get one. I had faced a really rough period in the Fall of 2010. I had some personal things going on, as well as my ever-continuing health problems. When I had to medically withdraw from school for the second time, I started questioning myself and my abilities. I felt like every time I tried to stand on my own two feet, something would come and just knock them out from under me. Was this cycle ever going to stop? Was I even capable of accomplishing anything in my life? 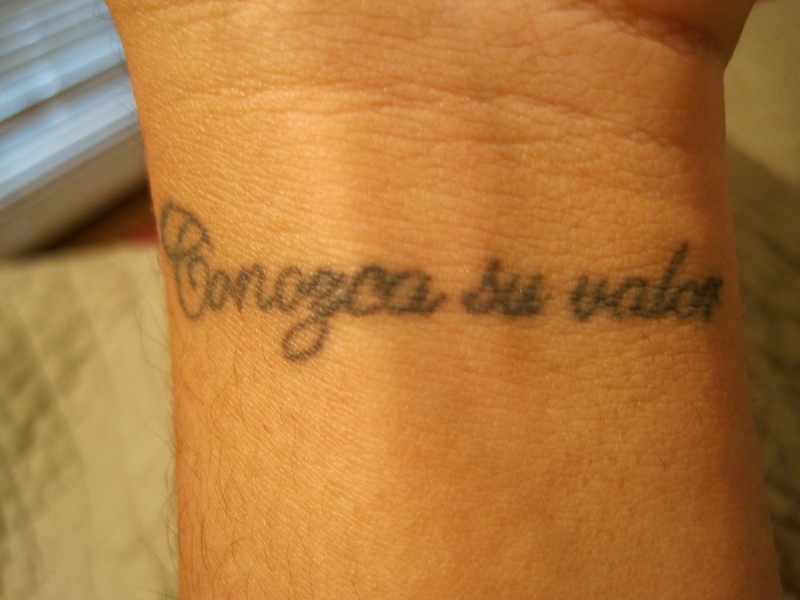 Then, as I was sitting at my desk in January 2011, when the phrase Conozca su valor came to me, I started to gain a different perspective. I was beginning a new semester, and marathon training was about to take off as well. I knew I needed this with me to serve as a constant reminder. Without hesitating, I called up my best friend Alex and asked her to accompany me the next day. She loved my tattoo idea and fully supported it–she even lent me the money to get it! Her presence made it much less scary and much more exciting. I’ll never forget that day. Now, two years later, I do not regret getting that tattoo for even a nanosecond. I felt beaten down before I got the tattoo, but I had no idea what was in store for me after. I remember when I showed the tattoo to my mom. Initially, she was disappointed by the thought of her baby girl getting a tattoo. But once she heard what it meant, the doubt melted off her face and she loved it. She knew how badly I needed that reminder, and she understood that it defined me. When I was in the hospital last Spring, I often found myself looking at it, feeling it, and reminding myself of my worth. The times I hated my body and the person I had become–taking one look at it would momentarily take me away from the negativity and hopelessness that I felt were chaining me to the ground. Even now, when I get frustrated because I feel like my life is moving very slowly, all I have to do is look down at my left wrist. It serves as a reminder of the most difficult years of my life, and how far I’ve come since then. And because I know my worth, I know I’ll continue to go far. This entry was posted in Anecdotes, Misc and tagged being sick, change, conozca su valor, discouragement, emotional, health, know your worth, love, marathon, motivation, perseverance, story, success, tattoo, value, worth, wrist tattoo. Bookmark the permalink. I know I don’t say this ever and also I am very bitter at times, but let me tell you today that you are a very very strong girl and you will ALWAYS achieve whatever you will target for. I am not very good with words but I am with you always with you and wishing you all the best for your marathon and I know you can do it. I HAVE ALWAYS KNOWN THAT YOU CAN DO IT. So get up and go for it, we are with you as always.